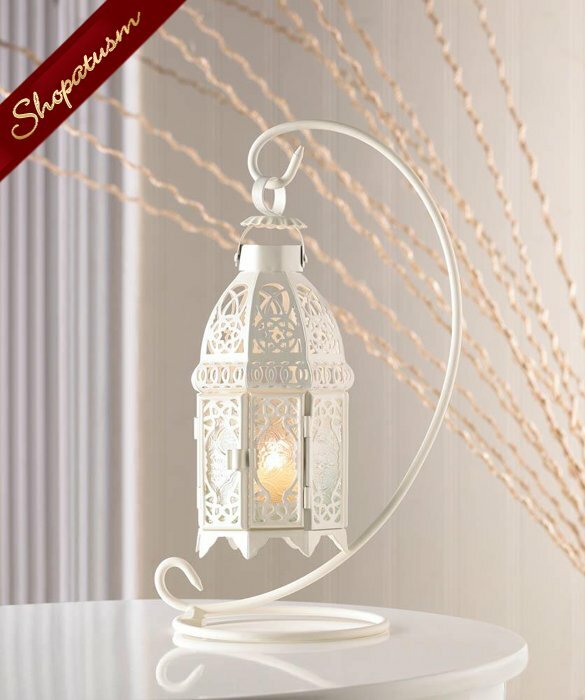 This is for a white hanging Moroccan lantern with stand from Shopatusm. The glow of a tealight through the glass panes and the charming lattice-designed cutouts of the shell add a romantic aura to any setting. Hang the lantern on the accompanying stand for heightened effect! Tealights only (not included). Metal and glass. Size: Lantern: 4 inch x 4 inch x 8 1/4 inch high. Stand: 5 1/2 inch diameter x 13 inch high.